WhatsApp is the world’s #1 messaging platform. From villages to big cities, from every part of the world, WhatsApp has over 1.3 billion monthly active users. Facebook owns this application in 2014 for a whopping $19 Billion. The developer team from WhatsApp is doing great work on rolling regular updates. From the past years, they are adding more and more features to this messenger. But now, WhatsApp has rolled out another great feature called WhatsApp stickers. 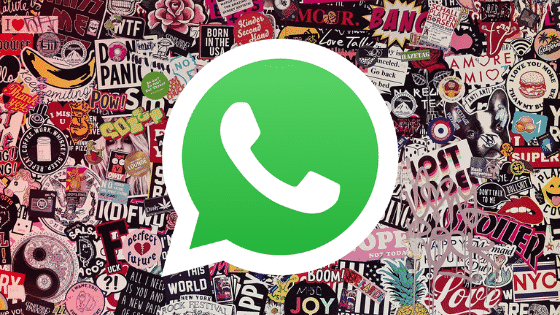 You can use WhatsApp status in all device provided you have the latest version of WhatsApp application on your phone. If you are looking for some new stickers and wondering where to download, you are in the perfect place. In this post, we have compiled a list of some best stickers available on the Google Play Store. The list contains different varieties of stickers like Cartoon, Games, Movies, TV Series, Dragon Ball, GOT, Pokémon, etc. Meanwhile, there are also some in-built stickers in the latest version of WhatsApp, but these few stickers on our list to download from the Play Store will work like pre-build stickers once you install it. You can download the best sticker packs for your WhatsApp messenger application from the list given below. Based on the category, you can download any WhatsApp Stickers from the Google Play Store link provided for each. This sticker app gives plenty of goodies to personalize your sticker sending option using an application fully. You must have a WhatsApp Beta installed in order to use this app. A packet of many stickers, that also lets you make your own custom stickers. You can even add your own text over the stickers. The name of this WhatsApp sticker pack may not be fascinating, but the stickers packed inside are amazing and good quality as well. This New sticker package contains different categories like Super Mario, Memes, Pokemon Go, etc. The number of stickers available in this package seems unlimited practically at this moment. The APK package of this sticker comes in at 30 MB (approx.) which is much larger as compared to other sticker packages, however, if you consider the number of stickers, it’s worth downloading the app. AIO Sticker for WhatsApp is one of the best sticker package available right now in the Google Play Store. This sticker package is for everyone, having a wide range of categories like Mr.Bean, Homer Simpson, and The Minions, probably the best-animated characters. This sticker package is something epic. Cinema sticker contains various movie character, including Freddy Kruger and Pennywise. There are several different categories in this package. Hence you won’t be stuck with picking a perfect one. If you are a movie buff, then we would unquestionably recommend you this package. If you are a 90’s kid, and you are a fan of Dragon Ball, then this sticker package is for you! The pack has over 300 stickers for WhatsApp based on Dragon Ball’s characters. This is the perfect app for users who want to use amazing stickers in their conversations. It provides over 500 unique WhatsApp stickers in one app. You can now share several characters and emotions with your friends and family. This app is packed with unique and original WhatsApp stickers and occupies only 29 MB space in your device. Do you like dogs? The Pug Emoji Stickers will let you send some cute dog stickers to your friends. But a small downside is the app is paid, and you have to buy at $1.2 approx from the Play Store. You can choose a lot of funny monkey from this package and send to your friends. The stickers are funny, and the big teeth will definitely make your friends laugh. This is one of the best apps for Newfoundland Dog fans as it gives more than 100 cute and funny Newfie dog emojis. You will also get emoji stickers and animated GIFs to share them with your friends and family. The app is easy to download and install and occupies only 3.5 MB. The app is updated regularly from the developer to enhance your user experience. You can now enliven your conversations with Shih Tzu Emojis Whatsapp Sticker application. This app is perfect for people who love dogs and dog stickers. The app enables users to add stickers of the Shih Tzu dog to WhatsApp and send it to your friends. The app requires 4 MB of your phone’s memory and can be run on Android 4.0.3 and up. Who else don’t know PUBG? Well, this is the most popular game in the world right now in the Android platform. If you are a die-hard fan of PUBG and you are coming straight out of Pochinki with your friends, then this sticker app will be best for you. Download from the link below! Counter-Strike is one of the best game ever created in the history of the gaming world. If you are a fan of this game, you must try Counter Sticker WAStickerApps sticker. The Rage Face Stickers will provide you with original meme faces to be used in your Whatsapp texts. You can now express your emotions through these cool meme stickers. The meme faces were a rage on meme post when they hit the market. The app is packed with 20 stickers and occupies only 3.5 MB of your phone’s memory. Memes are used extensively by users with great enthusiasm. If not anything, they offer you a good laugh and this app is tailored for those who are big meme buffs. The app has a wide array of memes and also includes PEPE the Frog. This sticker pack will eat up only 14 MB space in your mobile phones. This sticker application is touted to be created by ForoCoches forum and comes with a variety of options. You will also get a few meme stickers in this pack. The app is very small in size as it requires a space of only 6.4 MB. The sticker pack application is updated regularly and adds new stickers to the app. This application enables users to add stickers of the Troll faces in their WhatsApp chats. Now you can easily send some super cool troll faces to your friends and family. You can send the smileys only as images from the gallery. The app has a file size of 1.68 MB and can be easily downloaded. You can also use it on KakaoTalk, Facebook, Yahoo Messenger, ChatON, GO SMS etc. This app allows you to use its diverse memes in the form of cards. Users can also make suggestions under the shortcut section of the app and you will see your suggested sticker displayed in sometime. The app can be used on Android devices supporting 15 API and above. The app is 18 MB and gets updated regularly for the users and provides them new memes every now and then. This contains a number of championship stickers and emojis fromthe League of Legends. Users can employ these sassy stickers in their conversations. League stickers for WhatsApp can installed on Android devices supporting 15 API and above. However, the app may require a number of permissions on your Android device such as open network sockets, access information about networks etc. It will take 18 MB of memory. Which one is your favorite sticker? If you know any cool WhatsApp sticker pack that is not mentioned on our list, please do let us know by commenting below! We will surely update here!